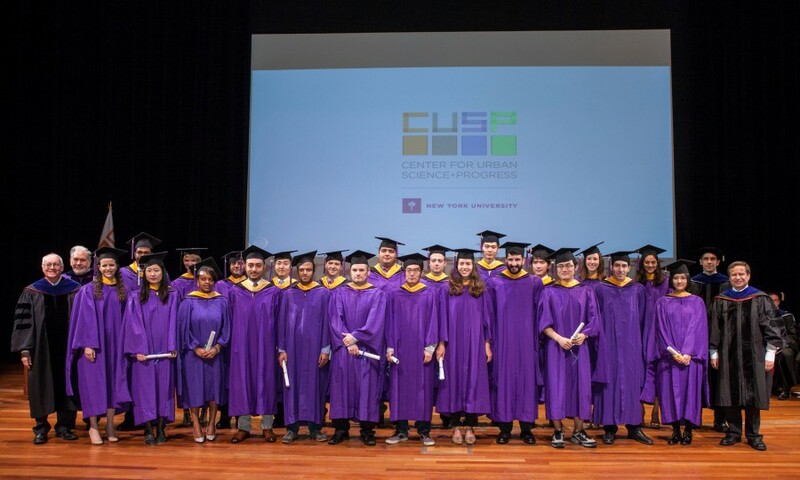 New York, NY – NYU’s Center for Urban Science and Progress (CUSP) and New York City Economic Development Corporation (NYCEDC) President Kyle Kimball today celebrated the graduation of CUSP’s inaugural class of students during a ceremony held at NYU Skirball Center for Performing Arts. The CUSP program, created as part of the City of New York’s Applied Sciences NYC initiative, is graduating a class of 23 students who have successfully completed a Master of Science program in Applied Urban Science and Informatics. These graduates will now transition into various careers where they will use their education to analyze large-scale data, from a variety of sources, in an effort to understand and address real-world challenges in the urban context, while critically transforming the City’s capacity for applied sciences and engineering and increasing its global competitiveness. CUSP’s inaugural class entered the program with degrees from 24 universities around the world and came with training in more than 20 different academic disciplines – some from the core disciplines like Mathematics, Civil Engineering, Computer Engineering and Physics; others with strong preparation in the social sciences such as Sociology, Political Science, and Urban Studies & Planning. During CUSP’s intensive, one-year, three-semester M.S. program, students study courses in the science of cities, urban informatics, and information and communication technology in cities. They selected from multiple policy domains to gain breadth and depth in the application of big data analytics to urban problems. The program also contains a focus on entrepreneurship and innovation leadership, and students are given the option to study technology entrepreneurship or “change leadership” in an existing organization. The core of the one-year curriculum is a two-semester project – the Urban Science Intensive – during which students, working closely with mentors from CUSP’s Industrial and National Laboratory partners, apply the principles of informatics to address an actual urban problem with a New York City agency to have a direct and meaningful impact on the quality of life in cities. CUSP was designated in 2012 as part of the City’s groundbreaking Applied Sciences NYC initiative, which was created by NYCEDC to expand the City’s top-tier applied sciences and engineering campuses to help spur economic growth and increase the city’s global competitiveness. The initiative offered to provide City-owned land and seed investments of City capital to universities interested in establishing or expanding applied sciences and engineering programs in New York City. CUSP is currently operating at 1 Metrotech Center in Downtown Brooklyn while its permanent home at 370 Jay Street, formerly occupied by the MTA and NYPD, is developed. CUSP’s presence in Downtown Brooklyn was critical to establishing the area as one of the City’s foremost tech hubs. Collectively, CUSP, along with the Cornell-Tech, Columbia and Carnegie Mellon Applied Sciences projects, are expected to generate more than $33.2 billion in nominal economic activity, over 48,000 permanent and construction jobs, and approximately 1,000 spin-off companies by 2046, fulfilling the initiative’s goal of dramatically transforming the City’s economy for the 21st century. When all four Applied Sciences NYC projects are fully underway, the number of full-time, graduate engineering students enrolled in New York City Master’s and Ph.D. programs will more than double, ensuring the strength of New York City’s position in a global economy driven by technological fluency and innovation. Using New York City as its laboratory and classroom, CUSP has set out to respond to the City’s challenge by setting the research agenda for “the science of cities,” and educating the next generation of engineers in how to apply this research, bring innovative ideas to a world market, and create a new, fast-growing and indispensable industry. And securing top-notch companies, government agencies, educational institutions, and organizations as partners. Looking to the future, CUSP has nearly completed its selection of graduate students for the Class of 2015, a class that is anticipated to be nearly triple the size of the Class of 2014. NYU also has unveiled its plans to turn the long-dormant 370 Jay Street in Downtown Brooklyn into a modern, sustainable academic center that will serve as the future home of CUSP. For more information on CUSP, its programs and initiatives, please visit the Center’s website, www.cusp.nyu.edu.